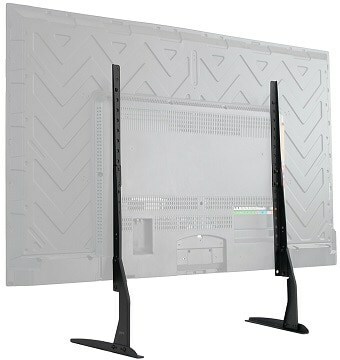 Got your sights set on a new TV but you have nowhere to put it and wall-mounting isn’t possible? There’s always the option of getting a TV stand! These stands don’t take up a lot of space, are relatively affordable, and are an all-around great purchase regardless of whether you’re getting a regular TV stand or one built with gaming in mind. Just as the name implies, tabletop stands are designed to be placed on a surface and function more or less as a replacement for the stock stand that comes with your TV. They are great for replacing a damaged or inadequate stock stand or for getting the flexibility of a VESA mount when wall-mounting is not an option. The first on our list is a simple tabletop TV stand from Fitueyes, a company specializing in TV stands and other types of AV equipment. This particular product is a bit basic, but well-built and highly reliable. It comes in grey and black models so as to better blend in with a variety of TV sets. It is made primarily of metal, but it does incorporate some plastic on the base, which mainly serves an aesthetic purpose. Naturally, it also includes rubber feet that help keep the stand stable on even the smoothest of surfaces. 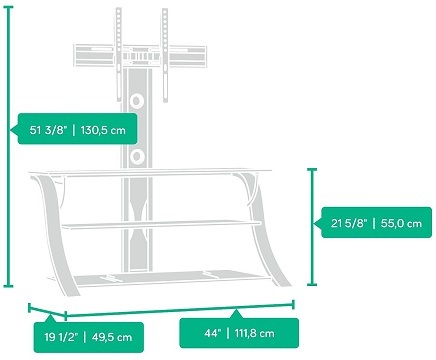 As for the mount, it supports every VESA standard up to 400×400, while the mount itself is adjustable in terms of height. Furthermore, it is strong enough to support TVs as large as 55 inches and heavy as 88 pounds. Needless to say, this makes it compatible with most modern TVs. The only qualm we have with this stand is that there is no swivel adjustment, but this is understandable given that we’re talking about a budget stand which already implements a height adjustment feature. All in all, it is a great fit for anyone who’s looking for an alternative to wall-mounting a TV. Do really want that swivel functionality? 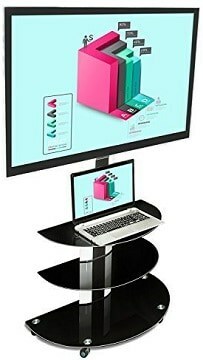 Then Fitueyes has another version of the above tabletop stand that features not only swivel but also supports much larger TVs that can be as large as 80 inches and as heavy as 200 pounds. On the other hand, if you’re aiming for a TV that large, there are also smaller and cheaper variants that are designed for 55 and 65-inch TVs. 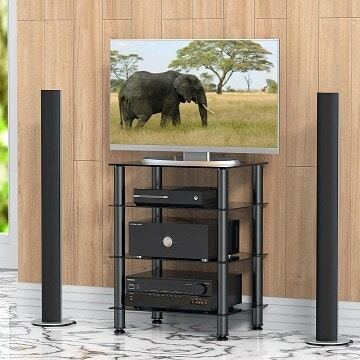 Visually, these don’t differ much from the previous, more affordable model, apart from the aforementioned swivel functionality and the fact that they support larger and heavier TV sets. They stick to the same neutral design consisting of black metal and a glossy base and are also height-adjustable. All in all, this is a slightly more expensive but also a more functional and slightly more premium-feeling stand. Its greatest merits are different models for different TV sizes, but those who do not aim higher than 60 inches will not exactly have any particular incentive to pick this stand over the basic one. The next universal stand from Vivo is a straight-up no-frills solution. It consists of two steel legs capable of supporting TVs as big as 65 inches and as heavy as 100 pounds. It is very easily adjusted to any VESA standard. While the stand itself is sturdy, stable, and more than gets the job done, a simple plastic chassis would have helped with the aesthetics, especially when it comes to hiding the screws at the feet. But all in all, if you’re just looking to replace your TV’s stock stand, then you will find that this solution from Vivo will suit that purpose well, and without leaving even a dent in your budget. 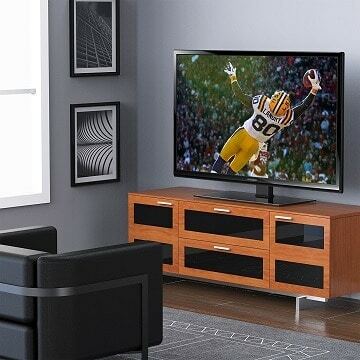 The next type of TV stand also incorporates one or multiple shelves that can be used to store consoles, AV equipment, and many other peripherals and accessories. 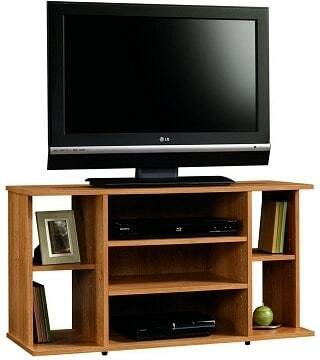 Many of them are actually closer to full-fledged entertainment centers than simple TV stands. Once again, we have a Fitueyes product, only this time, it is a more high-profile solution to the universal TV stand we took a look at in the beginning. 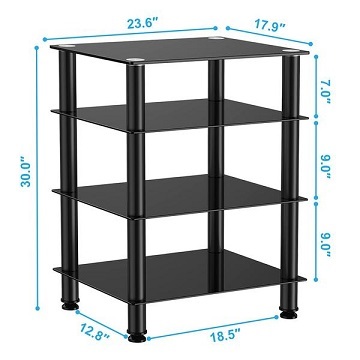 This 4-tier TV stand adheres to a similar design philosophy as the aforementioned product, with glossy black legs and four shelves which are made of darkened glass. 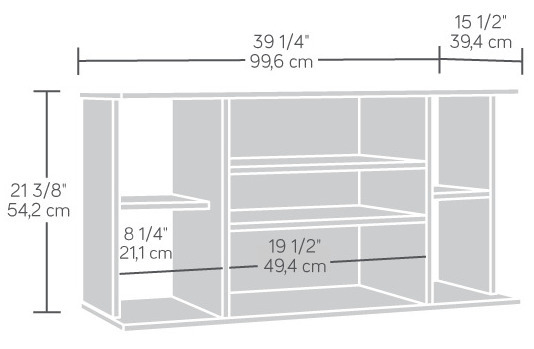 The topmost shelf is the strongest one, seeing as it is intended for a TV, and it supports up to 110lb of weight. 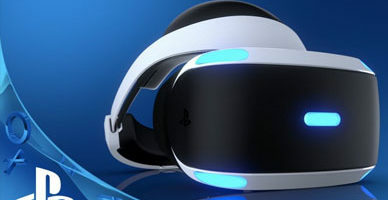 Meanwhile, the other three shelves will only support up to 33lb, which will be more than enough for any consoles, set top boxes, or other products you may want to keep on them. The stand itself doesn’t take up too much space and will thus fit in well with both living rooms and bedrooms. However, its diminutive size might not bode well for those who need a place to keep some bulkier pieces of equipment. Other than that, the only issue is the one that is generally prevalent with glossy surfaces – it is a real dust and fingerprint magnet. 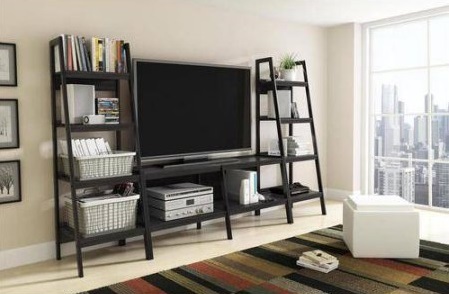 For the more traditional readers out there, Sauder has just the thing – the Beginnings TV stand. 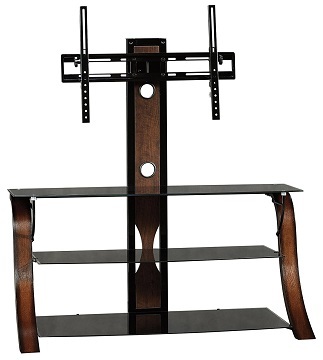 This wooden stand consists of a main top shelf designed to hold TVs as heavy as 70lb, and it also boasts three shelves for your equipment, two of which are adjustable. On top of that, it also has two additional minor shelves on either side, which are ideal for decorations or for storing your controllers and other peripherals. The oak finish is pretty much ideal for those who like their furniture made of wood, although it might not fit in every room. While we have no qualms with the material itself, the stand does seem to appear a tad cheap due to the bare-bones design. But considering the price tag, it is still a decent purchase. Next up is a rather functionality-oriented product, the Atlantic Centipede TV stand. From the very first glance, it is obvious that this isn’t a product you’d turn to for its aesthetic appeal (perhaps that is the inspiration behind the name) but it sure packs a number of convenient features. 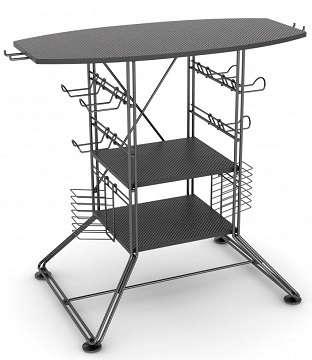 The stand relies on a rather durable double wire construction and includes three fixed shelves. The topmost one is, obviously, meant to support a TV. As such, it can support up to 80 pounds, whereas the two others can support up to 32.5 pounds each. On top of that, it comes with a number of storage racks on either side, allowing you to conveniently store all your controllers and other peripherals. In the end, for what the Centipede TV stand lacks in the beauty department, it definitely makes up for in terms of raw functionality. 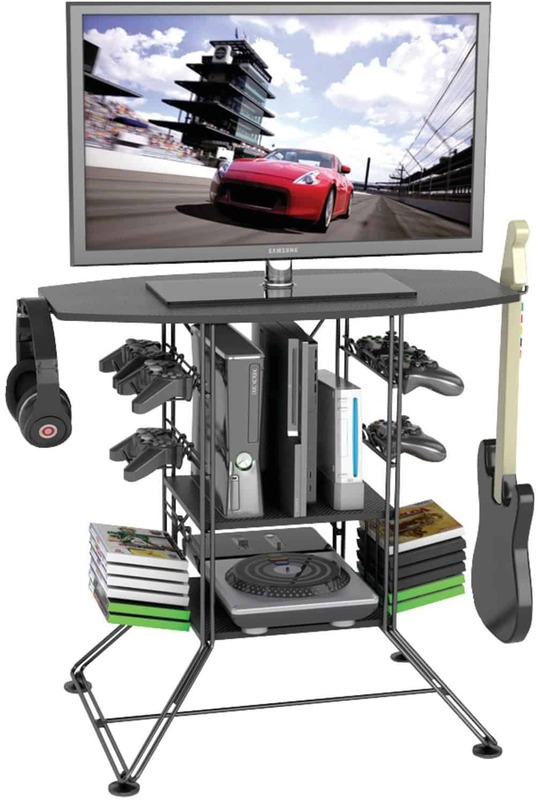 That said, if you wish to store multiple consoles and accessories but do not pay much mind to aesthetics, then this decently-priced stand might just be the right product for you. 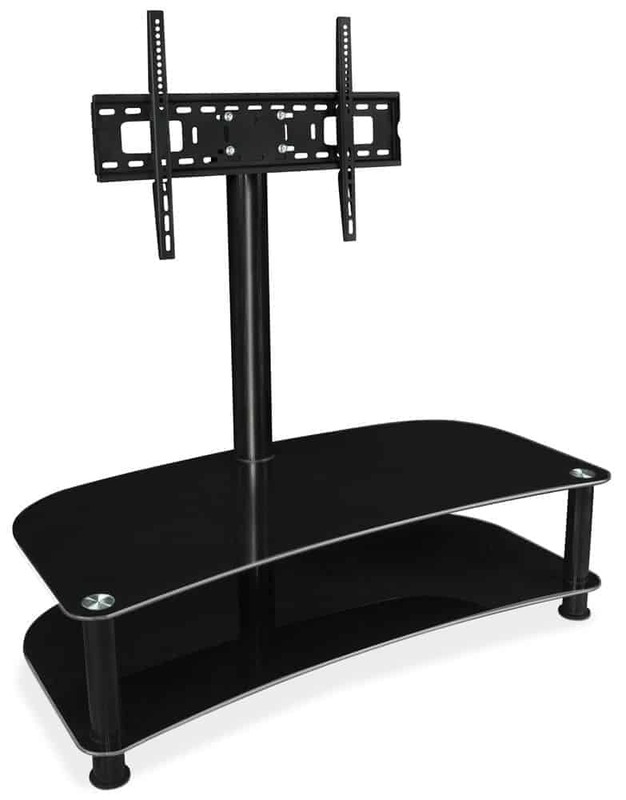 The MI-837 TV stand is made by Mount-It!, and it is an elegant and portable TV stand which is ideal for small rooms. Another key factor to this stand that should be noted is that it is of the highest build quality, incorporating both aluminum and tempered glass into its design. 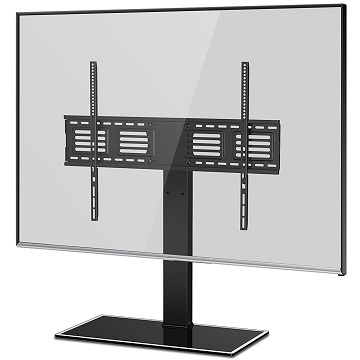 The stand includes a VESA mount supporting formats up to 600×400, meaning that it can also support TVs as large as 65 inches – provided that they weight under 88lb and support the VESA standard, of course. The tempered glass shelves are also remarkably sturdy, with the upper two being 5mm thick and designed for lighter equipment, while the bottom 8mm one is capable of supporting somewhat heavier load. We have nothing truly bad to say about the MI-873 other than the fact that the wheels, while practical, do not exactly contribute much in terms of aesthetics. The only other minor issue is just the same old problem with glass – it is a dust and fingerprint magnet. Following suit, we have another stand from Mount-it!, and it just happens to come from the same series as the previous one: the MI-860. In terms of appearance, the two look very similar, apart from a couple of key differences: the 860 comes with only two shelves which are quite a bit wider, making for a larger storage area. Furthermore, it is a stationary stand, without the wheels of its more compact counterpart. 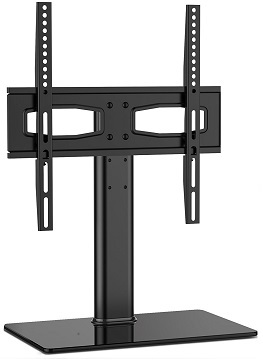 The VESA mount of the MI-860 is also largely the same, supporting TVs as large as 60 inches and as heavy as 88 pounds. What’s more, this mount also features swivel functionality. As before, the stand itself is made of aluminum and glass, meaning that is about as well-built as the MI-873. There are no significant drawbacks to this stand, other than the same-old penchant that glass has for attracting fingerprints and dust. Can’t decide between metal and wood? Don’t worry, the Ameriwood Home Lawrence TV stand incorporates them both, combining a black metal frame with dark grey shelves. It comes in two variants: the standard one, which supports TVs up to 45 inches in size, along with a larger one which has almost twice the shelf space and is capable of supporting TVs as large as 60 inches. The supported TV weight is 80 and 130 pounds respectively. 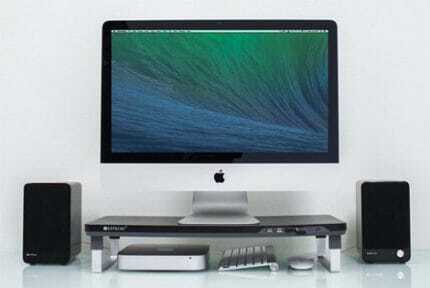 Aesthetically, the metal and wood blend seamlessly, and considering the colors, the stand will complement pretty much any modern piece of tech. The only problem with the stand is that the exposed screws on either side can be quite an eyesore, although they are relatively easy to cover up. 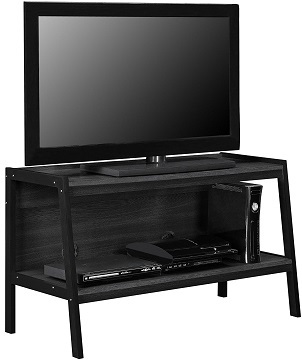 In the end, the Lawrence TV stand will fit in with any room and with any TV or console. It is stable, well-built, and those ugly screws are the only problem we have with it. And for the final entry in this category, we have a Sauder Veer TV stand, a stand that does equally well both when it comes to practicality and aesthetics. It consists of glass shelves, elegantly bent wooden legs, and a metal VESA mount that supports TVs as large as 50 inches and as heavy as 95 pounds. There is simply no denying that it looks great, but one simply can’t but raise an eyebrow at the price – especially considering that it only supports TVs up to 50 inches in size, when larger models are slowly becoming more and more popular, especially when it comes to living rooms. Nonetheless, the stand is of the highest build quality and will look good in pretty much any setting. As such, if you care about aesthetics, this stand just might be your pick number one out of all the other stands on this list. There is simply no denying that this stand pretty much has it all – it looks great, it is very well built, and comes in several variants so as to cater to a larger number of people. There is virtually nothing more you could ask out of a tabletop stand than what the Fitueyes one can offer. In the realm of those larger TV stands, it is not exactly easy to make a choice. There are so many more variants, and there is always the question of whether you should pick a unit that incorporates a VESA mount or not. However, out of all these TV stands, we chose to go with the Ameriwood Home Lawrence because we feel it combines most of the features that you’d want out of a stand – a sturdy build, a wooden finish, and an overall very neutral design. Furthermore, there is also the larger version of the regular stand, as well as an optional set of bookcases that blend seamlessly with the stand itself.